I discovered Beer and Burger Joint this past week, and I have already been three times! I attribute this both to my addictive personality and the incredible food that they serve. The concept is simple—massive burgers, with gourmet toppings, for a very reasonable price (average burger costing between $10 and $12). 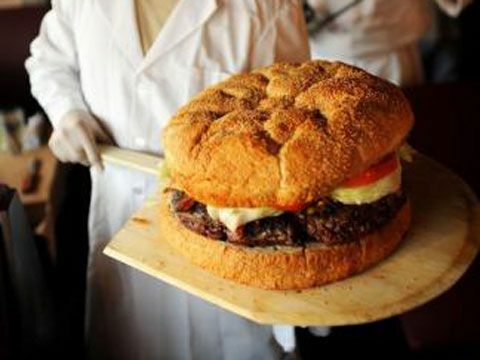 Of course there are also some specialty burgers on the menu that can get expensive, such as the Stairway to Heaven Burger, which costs about $39. But that burger comes loaded with 10 oz of kobe beef, 3 oz of foie gras, a black truffle demi, on a brioche bun, and is served with duck fat fries. It’s your 3 square meals for the day in just 1 sitting! My personal favorite however, is the vegetarian Dear Prudenceburger, which is two thick portabella mushroom caps, roasted red peppers, fresh mozzarella, arugala, tomato, and garlic parmesan cheese, served on a ciabatta roll. 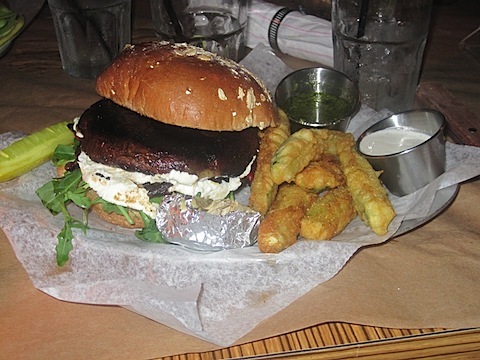 It is the largest portabella burger that I have ever seen, and I love it particularly for all the fun condiments that it is served with (I might have mentioned in former blog posts, that foodies like myself are condiment people by nature). It comes a side of walnut-basil pesto, a roasted garlic bulb, and zucchini fries that are accompanied by a creamy dill dipping sauce. The whole plate is just an assortment of deliciousness. If you do decide to take on this epic food challenge, make sure that you’re hungry because if you don’t finish the whole thing in 2 hours, then you are responsible for the bill, which is a staggering $75. However, if you do complete the challenge, then Beer and Burger will pay for your tremendous stomachache…isn’t that nice?